Record drawing of part of a frieze showing scrolling foliage and rosettes, with an acanthus at one end. Part of cyma reversa border detail. 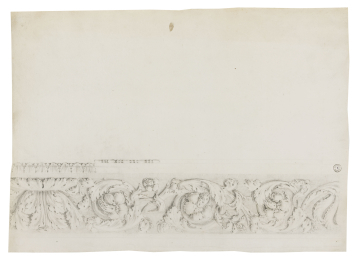 You are here: CollectionsOnline / Record drawing of part of a frieze showing scrolling foliage and rosettes, with an acanthus at one end. Part of cyma reversa border detail. This drawing is a more naturalistic version of the panel shown in Adam vol.26/75.